A great tool to try if you want to get into woodworking is a scroll saw. And the Rikon 16″ Scroll Saw is a great beginner’s tool. 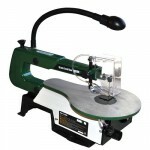 With its quick and easy set up, you’ll have it out of the box and cutting a pattern before you know it. To help you with that process, we’ve got a few videos that will help you through setting up the scroll saw and making your first cut. In today’s video, Ben Arthur, of the Highland Woodworking sales staff, will review the features and setup of this versatile tool, and show you a few of the things it can do. And make sure to tune in tomorrow for more of Ben’s scroll saw wisdom. This is a five day series of videos. To see the next post in the series, click here.